Safe, fun, non-toxic, colorful and mess free! Great fun for boys and girls. 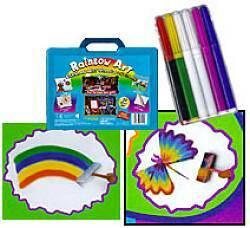 Let your imagination go wild with the Rainbow Art Kit. Create colorful pictures, magical places, unique designs with this Rainbow Art kit. Moisten the main sponge with tap water, dampen the specially designed brushes, rub the brushes back and forth on the colors and let your imagination create an endless array of designs.